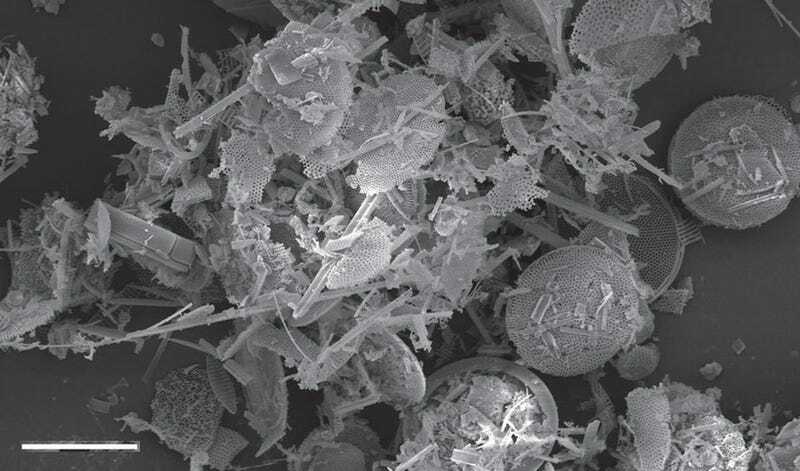 Scanning electron micrograph of diatom-rich sediments from the Southern Ocean. Image: Scherer et al. 2016. At the bottom of the world atop the forbidding Transantarctic Mountains sit the fossilized remains of microscopic, ocean-dwelling diatoms. For thirty years, scientists have argued over how these tiny algae came to rest thousands of feet above the sea. Now, sophisticated ice sheet models offer one of the best explanations yet—and it doesn’t bode well for our future. Since 3-million year-old diatoms were first discovered in the Transantarctic mountain range that separates East and West Antarctica in 1984, they’ve been at the center of an intense scientific debate. One side, the “stabilists,” says that fierce polar winds blew the creatures aloft from a faraway ocean. Another camp, the “dynamicists,” insists the microbial skeletons hail from a closer source—ancient seas in the Antarctic interior. In the dynamicist view, the diatoms were brought to their present location by the migration of glaciers as Earth’s climate went from hot to cold. The debate is less esoteric than it seems. In the stabilist world, the East Antarctic ice sheet—which holds enough frozen water to raise global sea levels nearly 200 feet—held strong during the Pliocene, a period of Earth’s history when global temperatures were 2 to 3 degrees Celsius warmer. But if the dynamicists are right, Antarctica’s largest ice sheet retreated dramatically in the recent past. And if retreat happened once, it could happen again. But in the decades following the first diatom discovery, computer models have become far more sophisticated. That’s why Scherer and several collaborators recently decided to revisit the question of the fossils’ provenance, using a popular new Antarctic ice sheet model that takes several long-ignored physical processes into account. These include “hydrofracturing,” in which water from melt ponds drains into ice sheet cracks, causing icebergs to calve off in rapid succession, and “cliff collapse,” which is pretty much exactly what it sounds like. The model also included Pliocene climate conditions, atmospheric winds, and isostatic rebound, wherein land rises after heavy ice sheets are removed. The results, published this week in Nature Communications, offer something of a middle ground between the two world views. The authors found evidence for strong glacial retreat around the perimeter of the East Antarctic ice sheet during the Pliocene, resulting in the formation of vast, algae-rich seas. The removal of all that heavy ice would have allowed the land to bounce up, creating algae-smeared coastal plains. Subsequent scouring of these plains by strong polar winds could have transported algae all the way up to the Transantarctic mountains. Although the analysis does not suggest as much an ice retreat as dynamicists have argued, the change would have been pretty dramatic for a time when the planet was just a little warmer and atmospheric carbon concentrations were similar to what they are today. “With the right physics, East Antarctica doesn’t need a lot of warming for the ice to retreat,” Scherer said. 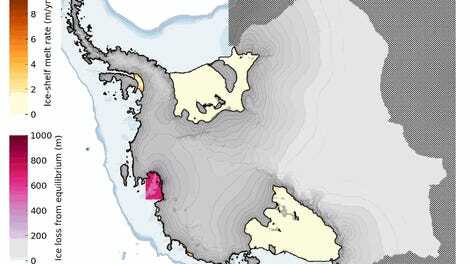 Modeled configuration of Antarctica during the Pliocene, with diatom-bearing mountains highlighted in red. Image: Scherer et al. 2016. Given how long scientists have been debating Antarctic diatoms, it seems unlikely that this study will be the last word. Nevertheless, it’s becoming harder for scientists to ignore the possibility that the East Antarctic ice sheet—like its ill-fated neighbor to the West—could start to disintegrate as our planet heats up.